More than 1,000 female Halliburton oil workers in the United States need to wear fire-resistant coveralls to do their job. They were typically wearing protective gear cut for men to get the job done. Now, in part thanks to West Texas innovators, they have another option. Sharla Watkins, senior human resources manager for the U.S. southern region at Halliburton, said during a visit to a field site with company management, they received feedback that the coveralls most women were wearing did not fit correctly. There were some coveralls for women on the market, but Halliburton thought they could improve them. After conducting focus groups to find out what women truly wanted in their protective equipment, Watkins said Halliburton set out to find a manufacturer who could make it happen. They partnered with Wolfforth-based RPS Manufacturing Solutions, who have a reputation of pioneering innovative solutions for workplace equipment. 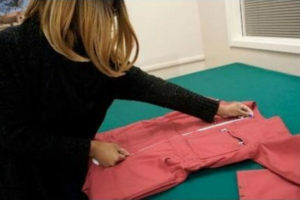 Tyneal Buckner, chief customer officer at RPS, said there were a lot of issues with the coveralls the women were settling for. For petite women, the sleeves and legs were too long. The waist landed around their hips. The traditional shirt collar was a bit bulky. Buckner recalled an article from Industrial Safety & Hygiene News, a trade magazine, that found women’s top complaint in their industry was ill-fitting personal protection equipment. Equal pay came in second. To get the design right, RPS brought in Su-Jeong Hwang Shin, associate professor and Apparel Design and Manufacturing Program director at Texas Tech. Shin has researched sizing systems and fit solutions throughout her career. She said she joined the project because she knew her expertise in sizing and apparel technology, and ability to use 3D body scan and pattern design systems could enable mass production and customization of the garment. Texas Tech apparel design and manufacturing senior Jessica Ozoude designed the coverall under Shin’s supervision and RPS’ direction, Shin said.